The best start in life for your pup! What makes the 5 Star Puppy Package your best choice? 5 Star Puppy Package has been designed to build the strong foundations for long term term success with your pup. We will work with you to help you find peace of mind on your new journey and provide a clear direction for progress with your training. When you want to give your puppy the absolute best start in life, there is no better option than in home training. Combining one-on-one home training with socialisation in your neighbourhood puts your puppy on the right path to becoming an obedient dog and a valuable part of your family. The true value of our approach is not only that we train your puppy, but that we give you the skills needed to train them yourself, ensuring effective and timely results. Our in home training program will involve our professional trainers creating a tailored program for your puppy’s temperament and specific needs. The first few months of your puppies life are the most critical for learning and development. At this stage of life (8-16 weeks) your puppy’s brain is a sponge absorbing as much information about this strange world as possible, by exposing your puppy to all the wonders of the world at a young age in a safe and controlled environment you can rest assured you will have a confident dog. When you want to give your puppy the absolute best start in life, there is no better option than in home training. Combining one-on-one home training with socialisation in your neighbourhood puts your puppy on the right path to becoming an obedient dog and a valuable part of your family. The true value of our approach is not only that we train your puppy, but that we give you the skills needed to train them yourself, ensuring effective and timely results. Our in home training program will involve our professional trainers creating a tailored program for your puppy’s temperament and specific needs. 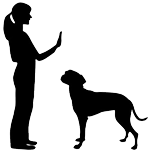 Speak to us about booking your 5 Star Puppy Package or Positive Puppy School. Call 0403 727 981 or email us below.